I went to college long before the era of laptops, so I learned to take notes the old-fashioned way: ink on paper. But that does not mean my note-taking system was simple. Indeed it was an intricate hieroglyphic language, in which asterisks and underscoring and check marks and exclamation points all had precise meaning, if only to me. It’s a lost art. Many college students have some kind of electronic note-taking device nowadays, and most will swear by them. And really, only a Luddite would cling to pen and notebook in the 21st century. Typing is faster than longhand, producing more legible and more thorough notes for study later on. But has anyone actually compared the two? Is it possible that laptops somehow impair learning—or conversely, that pen and paper convey some subtle advantage in the classroom? Two psychological scientists, Pam Mueller of Princeton and Daniel Oppenheimer of UCLA, wondered if laptops, despite their plusses, might lead to a shallower kind of cognitive processing, and to lower quality learning. They decided to test the old and the new in a head-to-head contest. Of course, students could develop an elaborate hieroglyphic system using a laptop. Keyboards have asterisks and exclamation points and so forth. They could also go beyond mere verbatim transcription, summarizing and paraphrasing. These are the strategies that in theory lead to deep processing and firmly encode new material in memory. But do typists do this, or do they just type as fast as they can? That is one of the questions that Mueller and Oppenheimer wanted to explore in a real-world setting. They ran a few experiments, all basically the same. In the first one, for example, college students were assigned to classrooms, some of which were equipped with laptops and others with traditional notebooks. They all listened to the same lectures, and they were specifically instructed to use their usual note-taking strategy. Then, about half an hour after the lecture, all of the students were tested on the material covered in the lecture. Importantly, they were tested both for factual recall (How many years ago did the Indus civilization exist?) and for conceptual learning (How do Japan and Sweden differ in their approaches to social equality?). This experiment provided preliminary evidence that laptops might be harmful to academic performance. The students using laptops were in fact more likely to take copious notes, which can be beneficial to learning. But they were also more likely to take verbatim notes, and this “mindless transcription” appeared to cancel out the benefits. Both groups memorized about the same number of facts from the lectures, but the laptop users did much worse when tested on ideas. At least right away. Remember that they were tested half an hour after the lecture, without opportunity for review. But what if these students did what students commonly do—leave the lecture, go back to the dorm, go about their lives, and at some point in time pull out their notes to study for an exam? Would having more thorough, transcribed notes prove an advantage in this more natural setting? The scientists tried to simulate this in another experiment. As before, some of the students took notes with a laptop, others with pen and notebook, as they listened to talks on various topics. They knew in advance that the exam would take place in a week, and that they would have a chance to study beforehand. As before, the test covered simple facts as well as concepts, inferences and applications of the material. The findings, which Mueller and Oppenheimer describe in a forthcoming issue of the journal Psychological Science, were a bit surprising. Those who took notes in longhand, and were able to study, did significantly better than any of the other students in the experiment—better even than the fleet typists who had basically transcribed the lectures. That is, they took fewer notes overall with less verbatim recording, but they nevertheless did better on both factual learning and higher-order conceptual learning. 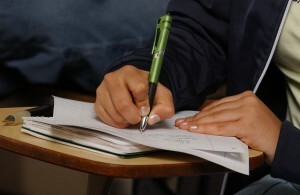 Taken together, these results suggest that longhand notes not only lead to higher quality learning in the first place; they are also a superior strategy for storing new learning for later study. Or, quite possibly, these two effects interact for greater academic performance overall. The scientists had one more intriguing finding. At one point, they told some of the laptop users explicitly not to simply transcribe the lectures word-by-word. This intervention failed completely. The laptop users still made verbatim notes, which diminished their learning. Apparently there is something about typing that leads to mindless processing. And there is something about ink and paper that prompts students to go beyond merely hearing and recording new information—and instead to process and reframe information in their own words, with or without the aid of asterisks and checks and arrows. This study is in line with other studies on the value of notes and note taking. I am glad to see that there is starting to be renewed interested in notes and note-taking – it is a critical part of success in college and has been largely ignored since the 1950s. I don’t think it is a matter of new vs. old technology, but rather how the technology is used and its suitability to the user’s goals. A student’s goal for taking notes is better learning and higher grades, and as the study shows using a laptop just as a way to replace pen and paper hurts more than it helps in achieving those goals. LectureMonkey is a new approach to lecture note taking – it enables a smart phone do the rote work of capturing the content of a lecture while letting students focus on listening, adding their insights and absorbing the material. Laptops can be used to add comment “tweets” to the recording, letting students benefit from the best of both worlds – a complete record of the lecture and its content along with a summary and index for later review. A second on the request for a citation. Thanks! The fact that laptops are recent means that paper and ink were used by students for most of their education (i.e. since primary school). Maybe using ink and paper for many, many years is why students did better than with a tool used only in college? In theory, it would be interesting to see a cohort of students using laptops since primary school. But practically, I’m not sure it’d be a good thing for said cohort. I’d like citations overall. I’m interested in this type of research, but since I’m conducting other research, I’m strapped for time. If students avoided verbatim and wrote what’s important (which I imagine longhand writers do, simply because they can’t write as fast), studying would probably be better, too. They would have the right information to study, memorize, and apply. Further, it is possible that a combination of the methods may be best, depending upon what you’re learning at the time. For example, I’m in a biology class. While I find a laptop is useful for recording words that explain concepts, provide definitions, illustrate descriptions, etc., I find that utilizing a notebook to draw diagrams, flow charts, molecular structures, and all that extremely helpful, too. The combination of both work best for me in this case. Here is the citation. It is going through final editing now, and should appear on-line within a few months. Mueller, P. A., & Oppenheimer, D. M. (in press). The pen is mightier than the keyboard: Advantages of longhand over laptop note-taking. Psychological Science. I fully subscribe to the research findings. In this era of mobile apps, social media and electronic gadgets hype, this research should be taken seriously by all academics in helping student learn effectively. Academics should take ownership for student learning and take the lead in implementing the right strategies for effective learning and not leave it to social media propagandists and electronic gadget manufacturers who have a clear vested interest. Is this a prospective cohort study? I have never been a laptop person. Not only in terms of note taking but interacting with documents. I generally take notes in bullet form focusing on key issues and draw lines, underline things etc. Harder on a laptop. Its too precise.Not organic enough. The i-pad has changed everything for me. I scribble notes in meetings and draw notes on, underline and colour documents. The keyboard and screen were always a barrier to dealing with documents, but I lap them up with the touch screen. Something about the kinetic nature of it all. I’ve gone paperless. Expect .pdfs and hand back paper at the end of meetings: email it to me. Even sign documents on screen. Never go back to paper and never with a laptop. To be clear I was talking about note taking and analysing documents. I would not create a line of text for anyone else other than on a keyboard and screen, usually a laptop. To me the precision of the keyboard and screen create a better platform to create clear and precise language. I simply never hand write for anyone else. But listening and absorbing is different. I requires integration of knowledge, not just capture of words. If note taking is centered on typing verbatim, yes, I can see how this will be detrimental to learning. However, I would be curious to see a comparison between traditional paper note taking and using tools on a laptop or tablet such as concept or mindmaps. I personally avoid taking notes in bullet form on my laptop and prefer using mindmapping tools that let me create links between concepts, and help me quickly re-arrange my notes later on (without having to retype, cut and paste, etc.). When others see me do this, there are always curious bystanders who will come up to me and ask what I am doing. Food for thought. Disclaimer: I’m a network and systems engineer. While laptops, tablets and computers all have their place, layers of technological abstraction really have no place in a group meeting where time is tight. I dreaded meetings where my precious time was wasted by “technologically savvy” big-wigs who burned meeting time finding the proper outlets, worrying about WiFi and banging on their devices as the batteries died. I bring a fountain pen, a spare and a notepad to meetings. The pad uses less desk real estate than even a tablet with a keyboard, and the pen’s “batteries” last for weeks instead of hours. I transcribe my notes to the computer later–and that’s how I retain the information. Hi there colleagues, nice post and pleasant arguments commented here, I am actually enjoying by these.